Why has it taken me two months to file my review of this book? Well, I’m dyslexic, so I’m somewhat disorganised. Not only that, it takes me quite a long time to read things, and then it takes me quite a long time to write things. I begin this way not to make excuses, or to wallow in self-pity but because, as I’ve read this book, I’ve been reminded what it’s like to be dyslexic, and that ‘dyslexia’ isn’t just a reading and writing issue. I’ve been reminded that it’s about memory, it’s about time, and it’s about organising information from all sorts of sources in different ways. The book is a collection of 105 short pieces (106 if the wonderful Foreword by Sir Jackie Stewart is included: how lucky Dyslexia Scotland is, to have Sir Jackie as its President!) 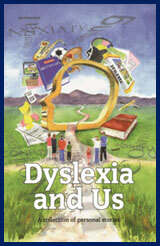 The contributions are stories, reminiscences, and arguments too, from dyslexics and from those who are related to dyslexics or who work with dyslexics. The contributors range in age from under 10 to over 60 and include parents, performers, students, people in work and people out of work, sportspeople, writers, business people, entrepreneurs, prisoners, teachers…even a member of the Royal Family. So yes, some of the stories are sad and grim…but there’s much more. There’s the relief felt on being identified as dyslexic, the joy of passing a test or getting to university, the bravery and tenacity of the dyslexic, the debt paid to good, observant teachers, mentors and counsellors, and the awareness and commitment of many non-dyslexics, often family-members. And there are laughs in the book, too: I chuckled at the ‘mounds of paper’ and the ‘parking fine’ stories. There’s no doubt that a sense of humour helps dyslexics…and can be used in subtle ways, too! Finally, back to the reading. Try not to read this book ‘from start to finish’. Dip into it once in a while. Mark the stories that give you particular comfort, insight or pleasure or those which make you want to DO something, and return to them, often. Make sure that your friends, dyslexic or non-dyslexic, read the book. Give them a copy as a present. Tell them, all of them, that it will change the way they see their world.